SharePoint 2013 has a REST API that exposes plenty of information about users, lists and document libraries. For front end developers, this is a gold mine. A gold mine because of two things: 1) SharePoint’s out of the box UI is pretty bad, and 2) SharePoint’s out of the box UI is pretty bad. Update 3/2017: I’ve added Search API to this post as well. Continue reading below. So plenty of room for improvement here. Now we can basically recreate SharePoint’s front end: entire new CRUD interfaces and such. And the base of it all – is its REST API. It is important to recognize that SharePoint REST API is using OData, which is a widely used convention when in comes to RESTful web services. You can learn more about the syntax from their website. For this post I would like to cover Selecting Items. Again, this will select “almost” all columns that are available to the list. Note that I said “almost”, because SharePoint’s REST API doesn’t really bring back everything. Things such as author information and values of lookups have to be queried differently (more on this below). )I find it good practice to only grab the columns that I need. This makes the payload as lean as possible. To get the number of items in a list, append the “ItemCount” in the end of your query sting. A more powerful solution is using the $filter key. Not that this option allows you to get items with more flexibility. Check out this example which grabs items with the title equals to “example 1”. Note the use of single quotes! Almost all values in SharePoint REST use single quotes! Notice that I used parenthesis to enclose the multiple parameters. This is completely optional – but improves readability. You see how we’re grabbing items with “ContentType” equaling to “Operating Policy” OR “Procedure” AND “Subject” equaling to “Safety”. Note that the “column” is the first parameter, then the value! This is a mistake that I’ve done several times because the documentation is pretty weak. Now, if you want to get items that “contains” specific characters, you use the “substringof()” function. Unlike startswith(), the substring() takes the “value” first, then the “column”. Again, note the difference between the two. This is also useful for creating paging systems – in combination with an offset option (below). So you know how to limit your results, and you know how to get the total items. All you need is to offset your results. You do this with the “$skip” parameter. Again, note the use of single quotes. The above will get a set of 10 items, starting from the 20th in the list. Combined with the total, you can create your own paging mechanism. Update 8/10/2016: I just found out that the $skip parameter doesn’t work with list items. There is a property in the REST response that you can use – for paging. This is known as the “___next”. I will do another tutorial strictly on this subject – so stay tuned. The above will return the author information in it’s own node called “Author”. 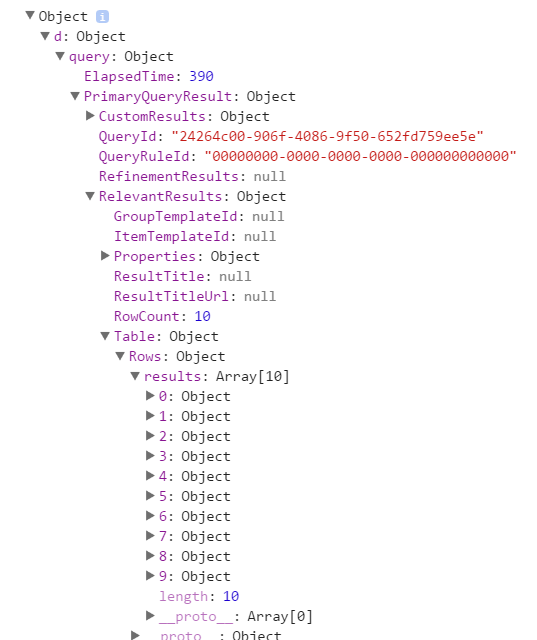 SharePoint REST API supports querying document libraries. Remember, doc libs are also lists and for the most part, are handled through the same endpoint. Although some information regarding document libraries require an entirely new endpoint. This includes file paths, subfolders, thumbnails and such. The above contains an entire new set of information regarding your library. Again, there may be additional information that is not returned by the above, such as user groups (below) which requires a different endpoint. Above is an example of a “promise”. For more on that, read my Working with jQuery’s AJAX, Promises and Deferred objects. There are times when you want to build an application that requires you to drill down to a choice column, and grab it’s values. A “choice column” in SharePoint is a type of column where you add values for users to choose from. The above will query the choice column “Subjects” from the list “LISTNAME”. You will notice that each result will have this __metadata object tied to it. This contains important material that will help you later in update and delete operations. I’ll cover that in the next chapter. If you have Search features turned on, you will be able to do powerful queries against any of your content inside your SharePoint farm. SharePoint search crawls through your material such as Word documents, Excel, PDF, Lists, Webpages – anything that you’ve configured to be searchable – you can query against in the SharePoint Search API. The tricky part is parsing the results. The “results” property of “Rows” is an array of objects. This contains the data you want to display. Adding a “selectproperties” querystring along with a comma separated properties that we need will do the trick. Again, note the use of single-quotes. Adding the “startrow” querystring will do it. Note that SharePoint Search API has a complex algorithm of sorting and returning results. Therefore, the total and the actual values are approximates. The “rowlimit” querystring is your friend. This one you will need the list Id. You can grab the list Id by going to your list / library, and clicking on “List Settings” or “Library Settings”. Once there, go to the URL and grab the value after “List=”. Note that this value is url encoded – with single quotes. So remove the leading “%7B”, and the trailing “%7D”. What you’re left with is the List Id. Remember to wrap your list id in single quotes. This query will only return items from the specific list that you’ve specified. For this one, it’s exacly the same as above. Simply replace the list id with this: “b09a7990-05ea-4af9-81ef-edfab16c4e31“. Yes it seems like it’s the same for everybody. “Best Bets” is SharePoint’s “elevated results”. These get pushed to the top of the result set, for specific queries. Note that these items are not included in the regular results – which means that it is not to be included in paging and filters and such. Haha! Ugly eh? Inside “results” is an array of objects you need. Note that the properties of each object may not be as complete as the primary results. Sometimes you don’t want the whole resultset to comeback. This is where filtering comes in. SharePoint Search API has “refinement filters” which does the job. The above will search for “TERM”, filtered with the “FILTERTERM” in the field called “FIELD”. So now we need to filter by many fields. Yes it’s possible, and we still use “refinement filters” in the Search API. Just like the single filter, but instead we add “and” in the beginning (you can also use “or”), plus separating the columns and terms with a comma. At times, the sorting of SharePoint’s Search API is not what you’re looking for. Well we can sort it. The example above shows the results being sorted by “LastName”, ascending first, then “FirstName” etc. As I’ve mentioned, SharePoint’s REST AND SEARCH API has some very powerful features. And with OData’s standard’s, you can create quite advanced queries. I will try to keep this article updated with more Select related queries, but for now I have to go. Stay tuned for the next part. I belive you accidently copied and pasted the first argument as a second argument for SharePoint REST API being a gold mine for front-end developers. So, what was the second argument? Hi Michael, great article. I’m trying to filter a query based on the properties in the ‘__metadata’ block (I’m interested in the version, so I’m looking at ‘etag’). I have a choice column and many other column with single lines of text . based on other column i want to get choice column and bind to dropdown . The field ‘FIELD NAME’ of type ‘Note’ cannot be used in the query filter expression. How to Add refiners for Date fields like Start date, due date. you didn’t elaborate about getting results using two lists. The main list with a lookup field Countries and the list Countries with the fields CountryName and CountryCode. I need to get the CountryCode which is associated with my Country in the main list. Using two lists as in Master Detail? That’s a very good question and really wasn’t scoped for this article. Master detail from SharePoint lists is an entirely new tutorial, which I will write about soon. How can i get most trending documents by search api. Good question. “Most Trending” as in “likes” or “most viewed” – you’d have to look for that in the Search API documentation. I want to get my all most viewed documents, i found some properties “ViewLifeTime” and “ViewRecent”, well it is working but m still not getting proper results. Please help me whats is wrong into it. I’m trying to get the list of all PDF files under library folder name ‘Submitted after 2017-06-13’. I’m using SOAPUI client to access the SharePoint 2010 Rest API. Question: Is the below syntax correct? how could I get (return) all pages in a subsite that contains (NOT equals) string “loren” in the title filtering by content type Topics for instance. The url I am trying to hit is behind my organization’s SSO, and I am already logged in with SSO when I am making the ajax request. Can you please tell what am I doing wrong ? You are trying to access data from a different website, even if it’s in your organization and you’re using SSO. You still need CORS in that server by setting “Access-Control-Allow-Origin” to “*”. You also need to set “Access-Control-Allow-Credentials” to “true”. So, I guess all arrows point to setting “Access-Control-Allow-Origin” to true on the server. But unfortunately, I don’t think that I’ll be able to convince the IT/Infosec to change the settings on the server-side. Is there any possibility of a work-around ? Once again, thanks a lot for your time to understand my query as well as for writing this tutorial. Are you trying to filter a list item with n categories? Hi, I’m looking for a SharePoint API expert to help us get SharePoint 2013 set up and working with AD FS claims based authentication. Thanks for the article, this is a nice reference. It says Part 1 in the title, but I can’t find a Part 2, is there one on inserting or updating? You’re absolutely right. I meant to write an insert + update + delete data. That’s still to come. Hi i need to make an android app which utilises the SP APIS . For sending requests i would require the token first. Any view on how to login and get token? When I run the queries above (namely the all items all columns) the object that is returned in “data” is a Document Object, and it appears to be the entire page’s content. Does this mean I did something wrong? the data object should have d.results – which is another object. Hmm. Bizarre. I don’t know what’s different between what I had and what I have now, but it’s returning a data object with a ‘d’ property.